Sergeant Loren Whitehat was shot and killed as he assisted his twin brother, also a Navajo Division of Public Safety officer, arrest a DUI suspect. The suspect had fled into a nearby rocky area off of Highway 160. When Sergeant Whitehat caught the subject, the man was able to gain control of his service revolver. The man opened fire, killing Sergeant Whitehat. The subject was convicted in connection with Sergeant Whitehat's murder and sentenced to six years in prison. Sergeant Whitehat was assigned to the Tuba City District. 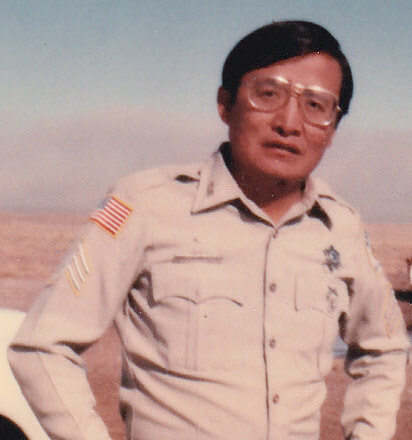 He had served with the agency for one year and had previously served four years as a tribal ranger for the Navajo Resource Enforcement Division. He was survived by his twin brother. You, along with those (passed and currently serving) who've dedicated their lives protecting others will always be remembered for the heroic acts performed in the line of duty. Continually watch over, as you are the guardian angel. You are still in the memories of our people and in the hearts of those dearly loved.